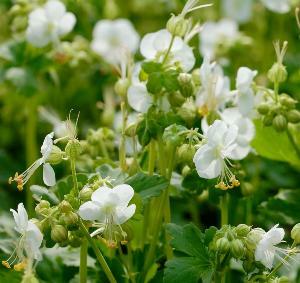 Geranium macrorrhizum 'White-Ness' is commonly known as Cranes Bill. It is a semi ever green perennial with a mat forming habit. It has neat pale green leaves and pure white flowers during the summer. It will grow in sun or shade and moist or 'well drained' soil. Grows to 0.5m and spreads to 1.0m. Hardy.